Last week, I noted Gen. Gage’s receipt of Lord Germain’s orders to make more of an effort to suppress the rebellion. Colonists had been training and preparing for armed conflict for months. Everyone anticipated a deadly encounter. It was just a matter of when, where, and who would fire first. 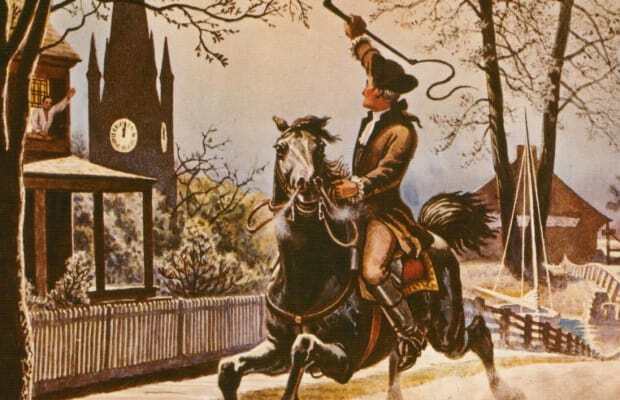 On Easter Sunday April 16, 1775 Paul Revere rode out to Lexington to warn Hancock and Adams that some raid was imminent. Thanks to Benjamin Church’s regular messages, Gage had known for some time that most of the colonial stores were in Concord and Worcester. Worcester was nearly 40 miles away. Soldiers could not march there and back in one day. Concord was only 20 miles away, meaning troops could march out, capture or destroy the munitions, and return in a single day. Gage hoped the militia would not have enough time to react. On Tuesday, April 18, Gen. Gage received intelligence that the stores in Concord remained there and had not been removed. The Provincial Congress had adjourned until May meaning defenses were lower as well. This was the time to strike. Gage also knew from earlier alarms that the necessary element of surprise had been impossible. Riders always seemed to reach their target faster than his soldiers could march. He did not have any significant cavalry for fast moving actions. To counter this problem, Gage deployed 20 officers and sergeants on horseback on April 18. Their mission was to stop any riders attempting to alert the countryside to the movement of British troops. Yet this unusual deployment of soldiers in the evening was itself enough to raise a general alarm that something was happening. The Patriots fully expected Gage to try to prevent any alarm, and that he would likely shut down Boston to prevent word reaching the militia. 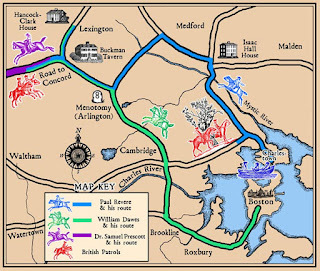 In Boston, Joseph Warren planned for multiple riders using different routes. He would send one messenger by land across Boston Neck. Although Gage would likely shut down Boston Neck at some point, doing that too early would set off alarm bells. Therefore, a messenger might pass through before the gates closed. Another messenger would row across the harbor to Charlestown, where a horse would be waiting. The river crossing had its own dangers, since the navy deployed ships to block any such crossings. The third method was a pre-planned signal from Christ Church, also known as the Old North Church. When troops were leaving town, which would happen at night, patriots would raise a lantern signal in the church tower. One lantern meant the soldiers were marching overland through Boston Neck. Two lanterns meant they were deploying in longboats to cross the harbor. A rider in Charlestown, waiting for the signal, would ride out to alert the countryside. To use any of these methods, Warren had to figure out when the British were leaving, and what they planned to do. The soldiers would most likely leave at night after night time roadblocks prevented any civilians from leaving town. By late afternoon, it seemed clear that a deployment would take place that night. Warren went to confer with one of his top secret intelligence sources. No one knows for certain who this source was. Warren alone knew the identity, knowledge that he carried to his grave. Some stories indicate that Warren’s spy was none other than Gen. Gage’s wife, Margaret Kemble Gage. 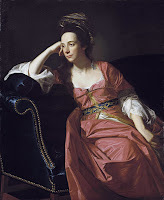 Thomas and Margaret Gage had married in 1758 and by all accounts had a close and loving marriage, producing 11 children. Her brother Stephen served as one of Gage’s officers. Another brother, Samuel, served as Gage’s private secretary. Yet there is some evidence that Margaret, who was born and raised in New Jersey, and whose family had lived the colonies for generations, had some sympathy with the patriot cause. 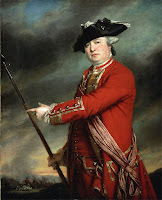 According to one account, on the afternoon of April 18, Gen. Gage informed on of his generals, Lord Percy, of his plans to take Concord the next day, Gage made clear that this was top secret, not to be revealed even to his other officers. While walking back from headquarters, Percy heard several men discussing the planned attack and that the target was Concord. Percy immediately returned to Gage to tell him this, at which point Gage became irate. He said he had only shared his plans with one other person so far, besides Percy. This story is not in any contemporary records, and seems to have been written years later. Therefore, it may be apocryphal. Even if true, Gage did not say who that other person was. No other officer ever received any sort of reprimand. That is one reason why some people point the finger at Margaret. As evidence, they point to the fact that he shipped his wife back to London shortly after these events, and that their marriage was strained after he joined her in England. 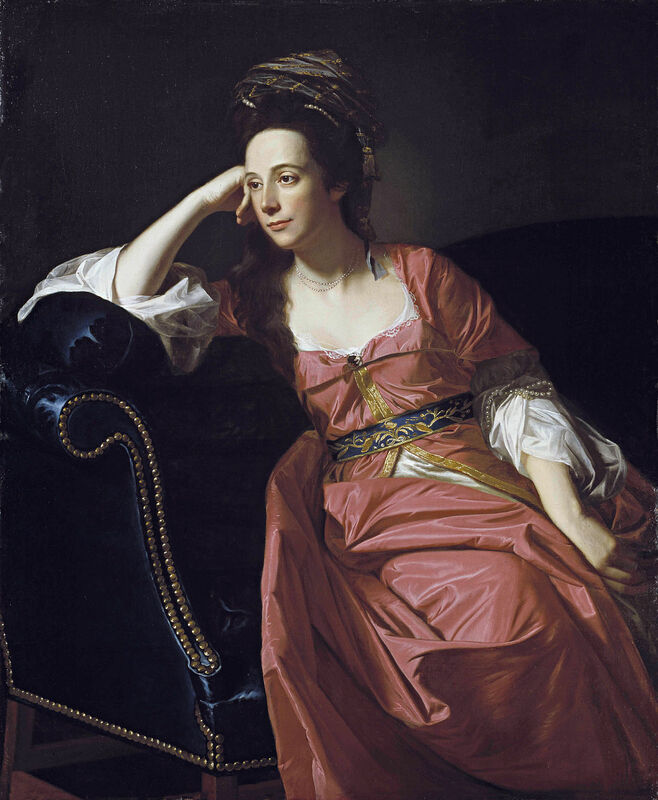 But Margaret did not leave Boston until August, four months after the fact. There was good reason for her to leave at that time since hunger and disease were spreading through Boston by then. Also, as far as any estrangement, Margaret was about one month pregnant when she left, and the couple would have another child after Gen. Gage returned to England. What makes me question this even more is that Warren’s message was wrong. He sent his riders to Lexington saying the British would attempt to capture Hancock, Adams, and possibly other leaders. That was not part of Gage’s orders to his commanders. He was after the munitions at Concord. It was only after the army marched that patriot leaders decided that it was too large a deployment to capture a few men and that they must be going after the munitions. Warren was still guessing at Gage’s ultimate goal, as were just about all the British officers sent out under secret orders. Gen. Gage granted command of the expedition to Lt. Col. Francis Smith, a competent officer though not particularly outstanding. Neither Gage nor any of his three division commanders would participate in the mission. Smith would lead about 700 men to Concord via Lexington. His goal was to capture or destroy all arms and ammunition in Concord. Gage’s orders say nothing about capturing any patriot leaders. It is possible the riders he had sent out earlier that day, whose primary mission was to stop any couriers, may have been ordered to arrest leaders as well. According to some of the locals they stopped that night, they interrogated them about the whereabouts of Hancock and Adams. But if it was a consideration at all, it did not seem to be a primary one. Rather, this seemed to be just another mission to capture or destroy munitions, much like earlier raids on Quarry Hill, Portsmouth, and Salem. Smith informed only a few top officers of the mission. Most of the junior officers would not learn of the mission objective until they reached Lexington. They simply received orders that evening to assemble their men on the beach near Boston common at 10:00 PM. At around 8:00 PM, Warren summoned William Dawes, a Boston tanner who was part of Paul Revere’s spy network. Although Dawes was a loyal Patriot, he seemed to have a friendly relationship with the soldiers and regularly passed through Boston Neck on business. He was able to ride out of Boston around 9:00 PM. A few minutes after he left town the guard received word to shut down for the night. No one else would pass in or out that night. Dawes headed for Lexington. He did not hurry there, nor is there good evidence that he alerted anyone along the way, although some claim he did. Warren simply directed him to warn Hancock and Adams that they might be targeted for arrest the following day. After troops began to assemble around 10:00 PM, it became clear that the raid would begin that night and would involve hundreds of troops. Warren met with Revere around that same time to tell him to cross the harbor where a horse would be awaiting him in Charlestown. From there, he could ride to Lexington and Concord to warn everyone. Before Revere crossed the harbor, he went to find a friend at the North Church. According to the pre-arranged plan, Robert Newman, a sexton and or Thomas Pulling, a vestryman at the Church (accounts differ) climbed to the steeple a little after 10:00 PM. They lit two lanterns, hung them out for about one minute, then climbed back down. That was enough to alert patriots in Charlestown, who sent out at least one rider. My sources seem a little vague and contradictory on how many riders set off from Charlestown, but some indicate more than one. It appears, though, that any rider or riders that started the trip, did not finish it. British officers doing their job to intercept any riders that night probably captured whoever had been sent. The signal also told the Charlestown patriots to have a fast horse waiting for Revere as soon as he crossed the harbor. Aided by two other patriots, Revere crossed the harbor in a small rowboat. They used muffled oars to avoid notice by the naval vessel keeping watch in the parbor. 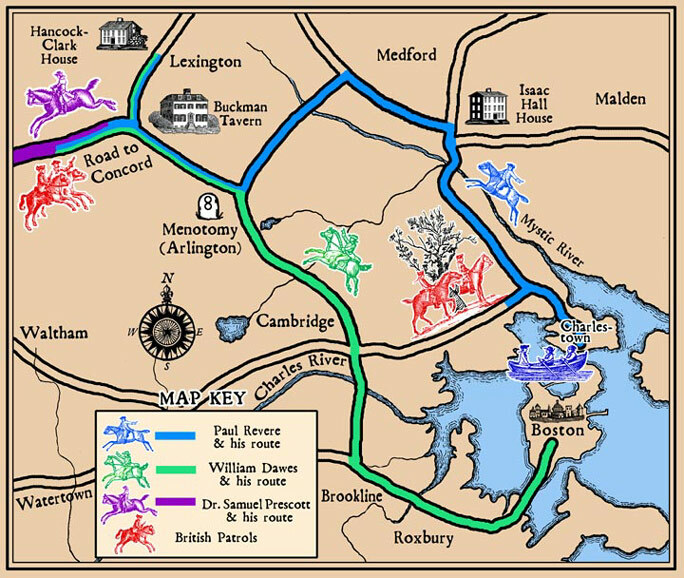 By 11:00 PM, Revere had crossed the harbor, found his horse, and left Charlestown on his way to Lexington. Before leaving Charlestown, locals warned him that they had seen soldiers on horseback along the road, possibly waiting to intercept riders. Shortly after starting down the road, Revere saw two men on horseback under a tree up ahead. He soon realized they were British regulars. He turned around and took off at a gallop. The British riders gave chase, but Revere’s knowledge of the land and a faster horse allowed him to leave his pursuers behind. Instead of riding down Lexington Road, Revere detoured up Mystic Road, to the north, heading through what is today Medford. This route was a little longer and out of the way, but it also turned out to be free of any more sentries. Along the way, Revere alerted any farms or small towns that he passed through. Many of Revere’s calls to alarm were not random houses that he happened to pass. Revere knew very well who the militia leaders were, who could be available to ride to other towns and continue to spread the alarm. This night was the culmination of months of organization and planning. By midnight, multiple riders were spreading over the colony while militia captains began summoning their units. Revere’s word that the regulars were marching toward Lexington and Concord that night was all they needed to know to call up their men and move toward their target. Following his detour through Medford, Revere turned south again to the town of Monotomy (current day Arlington) and continued on the main road to Lexington. Revere finally arrived in Lexington a little after midnight on the morning of April 19. He went straight to the home of Rev. Jonas Clarke, where Hancock and Samuel Adams had been staying for more than a week. Along with them were Lydia Hancock, John’s Aunt and adopted mother, as well as his fiancée Dorothy (Dolly to her friends). The Lexington militia had already mustered, after being put on notice by the British sentries that rode out earlier that day. 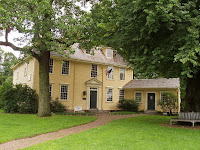 They posted a guard around the house were Hancock and Adams were staying, with the main force drinking over in Buckman’s tavern. The guard in front of the house told Revere not to make so much noise at this late hour as people inside were trying to sleep. Revere responded “Noise! You’ll have noise soon enough before long. The Regulars are coming out!” After rousing Clarke, Hancock and Adams, the men went over to Buckman’s Tavern to discuss matters over a few drinks. A short time later, William Dawes, who had left Boston hours before Revere, finally arrived. He had taken a longer route on a slower horse, resulting in his late arrival. The group decided that such a large force would not be out to arrest a few leaders. They must be after the munitions at Concord. Hancock wanted to collect his arms and fight with the Lexington Militia. But Adams and Revere quickly convinced him that he was too important a target for the regulars and needed to leave town before they arrived. Adams and Hancock prepared to flee to another safe house farther away. The militia was already gathering on Lexington Green. 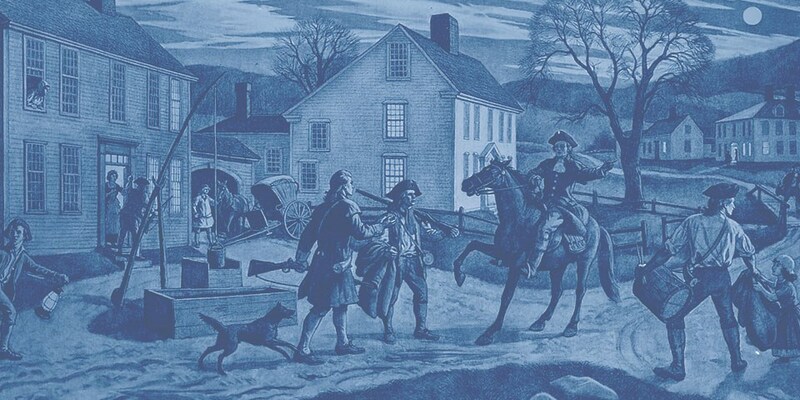 Revere and Dawes continued their ride to Concord to alert the militia there. The two men set off around 1:30 AM. Just after leaving town, they met another rider, Dr. Samuel Prescott, a young man who was returning home to Concord after a late night visit to his girlfriend. He agreed to join the men and assist them. Fearing they might meet another military patrol, the group warned every house they passed, each man in turn stopping to alert a house while the other two rode to the next ones. After a few miles, the three men met another patrol. Officers on horseback with pistols demanded their surrender. Instead they made a run for it. Revere dashed for the woods but ran into another group of soldiers and was captured. On his slow horse Dawes somehow rode away after the patrol chased after Revere and Prescott. After he got away though, his horse threw him and took off. Without a horse, Dawes walked back to Lexington. Prescott, who knew the area best and had the freshest horse, jumped a stone wall and escaped his pursuers. He stayed off the roads, riding over fields to reach Concord in time to deliver the alert. Prescott continued to alert other houses along the way and recruited other riders to spread out across the countryside. 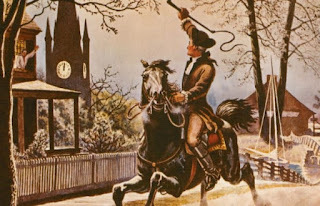 He arrived in Concord around 2:00 AM where he used the church bell to alert the militia. He delivered the alarm and then continued on to other towns. Others used prearranged signals including three gunshots, or signal fires on top of hills to spread the alarm. Revere’s ride was over for the night. The angry and tired officers took him into custody and held him along with four other riders that the patrol had stopped earlier. The patrol questioned their prisoners, particularly about the whereabouts of Hancock and Adams. While Revere was not going to give up that information, he was happy to tell them his own identity. They already knew the name Revere. Revere also told them more about their own mission. Gage had deployed these soldiers the day before with instructions to detain riders, but did not tell them why. 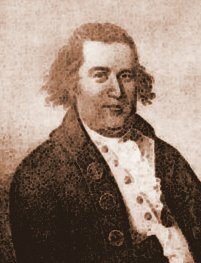 Revere informed them of the soldiers deployed under Col. Smith who had crossed the harbor to Charlestown and were marching out in their direction. He also told them that the militia was already on high alert and was gathering in Lexington. He may have been trying to discourage the group from returning to Lexington and possibly finding Hancock and Adams still there. The party, however, rode their captors back toward Lexington. Upon approaching Lexington a little after 2:00 AM, the group heard gunfire, most likely militia members discharging their weapons before entering Buckman’s Tavern. The sound of gunfire unnerved the British officers. They released their prisoners and rode quickly back to Boston, without entering Lexington. Though they confiscated Revere’s horse, preventing him from spreading further alarm. Revere walked back to Lexington. Around 3:00 AM, Revere reached Lexington. He returned to the Clarke house only to find that Hancock and Adams were still there. Hancock had decided not to leave town and was cleaning his gun and sword in preparation to join the militia. Although he had never seen combat, Hancock had been commander in the Boston militia for decades and considered himself a military man. Adams was still trying to convince him he needed to leave. Revere weighed in, discussing his own capture only hours before. The men received a report that an British officer had asked a local where the Clarke Tavern was. There was no such tavern, but it was clear the British were looking for the men staying in Clarke’s home. Finally, Hancock agreed to leave with Adams and Revere for Woburn, a small village a few miles northwest of Lexington. They took Hancock’s coach, which was a fancy and highly recognizable. Fortunately, they did not encounter any soldiers during their escape. 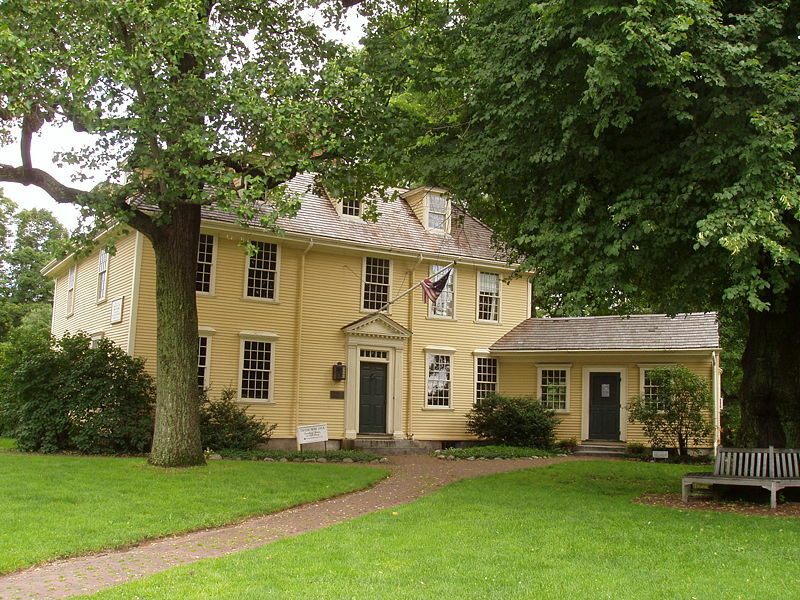 Hancock left behind his aunt and fiancee, but made it to Woburn without incident. Revere decided to return to Lexington to see what was happening. Hancock sent his coach back to Lexington. Someone had given him a fresh salmon the night before, and he wanted to collect the fish for his dinner. Oh, and as long as he was collecting his dinner, the coach could also bring Aunt Lydia and Dolly. 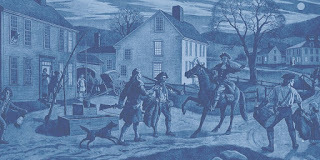 When Revere returned to Lexington, one of Hancock’s aides asked him for help. While Hancock had secured his family and his dinner, he had neglected to collect a trunk full of top secret papers with all sorts of information about the Provisional government’s activities and strategy. That trunk was still sitting in Buckman’s Tavern. Revere and the aide went to secure it. While in the tavern, Revere heard the men saying that the whole night had been a false alarm. The Lexington militia had turned out hours earlier. Tired of waiting, they had sent riders to look for the regulars. One rider had returned saying there was no sign of any army. The militia commander dismissed his troops but told them to stay in the area just in case. Most of them continued to hang around Buckman’s Tavern, enjoying a few beers. While Revere was arguing with the men that it was not a false alarm and that he had seen the soldiers himself, the other militia rider returned saying that the soldiers were, in fact, on the way, and were almost in town. The militiamen scrambled to get into formation before the British arrived. Meanwhile, Revere struggled to get Hancock’s top secret papers out of the tavern. Around this time, near dawn, the army entered the town to face the quickly assembling militia on Lexington Green. Revere carried Hancock’s trunk into the woods as he heard the first shots of the Revolution. American Revolution Podcast is 100% free and completely ad free. I appreciate any support. If you are not in a position to help, please continue to enjoy at no cost. Also, see the bottom of this page how you can support this Podcast by making purchases you would make anyway on Amazon. Visit https://amrev.podbean.com for free downloads of all podcast episodes. French, Allen The Day of Concord and Lexington The Nineteenth of April, 1775, Boston: Little Brown & Co. 1925. French, Allen (ed) A British Fusilier in Revolutionary Boston, by Lt. Frederick Mackenzie, Cambridge, MA: Harvard Univ. Press, 1926 (Mackenzie was an officer in the British Army, occupying Boston in 1775. This is his diary). Smith, Whitney (ed) Concord town records: manuscript transcripts, 1774-1776, Unpublished Manuscript, 1774. Miller, Joel The Revolutionary Paul Revere, Nashville: Thomas Nelson, Inc. 2010. * This site is a registered Amazon Associate. Please help support this site by purchasing any of these books, or any other Amazon product, via the links on this site. You can also click on the link below to go to Amazon, buy whatever you want, and American Revolution Podcast will get credit for your purchase. Thanks for this very informative project. I look forward to listening each Sunday evening.